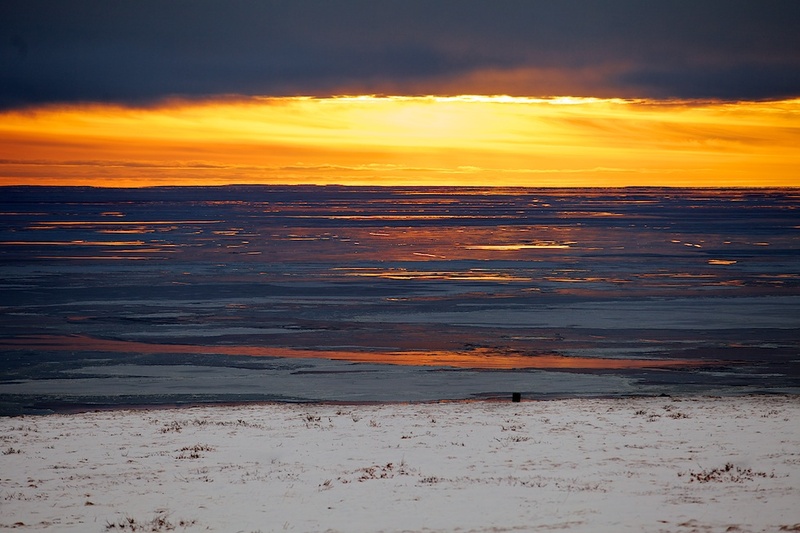 Chukotka in November is an equation with many variables and two unknowns. First is Time, and second is Space. Both have their own dimensions – incomprehensible to the rest of the world. And there is also such a thing as Luck. And yes, we were lucky again. We did not make it by helicopter, but instead we made it by boat! And why we were lucky? Because our old friends were by our side. And now even more friends are waiting for us on the shore, greeting us and shouting something what we can’t hear yet. Hello, Chukotka! We are happy to see you again! In November the weather changes every other minute and there is no possible way to forecast it. It is too late to travel by boat (even though we did – on a tiny homemade ice-breaker), and too early by dog-sled or car. Flights are being cancelled all the time – sometimes for a week, and sometimes for a month. 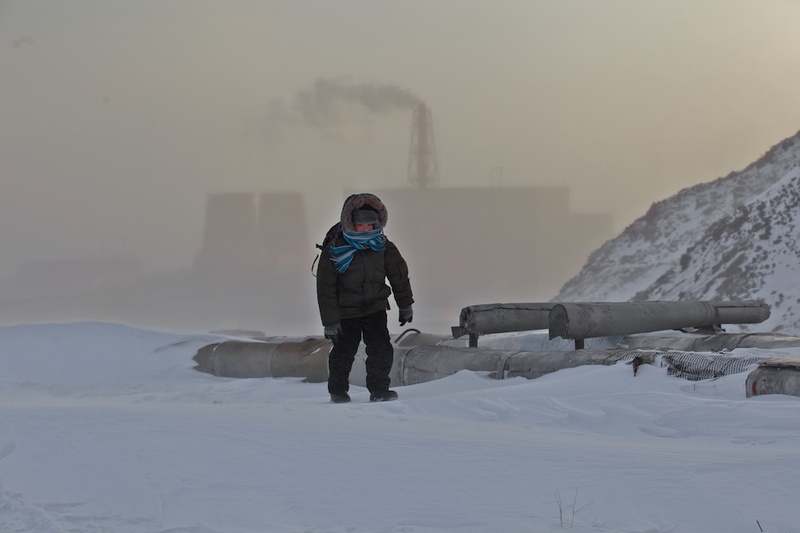 In the last 30 years we have been to Chukotka many times – in the winter and in the summer, but never in November. November was always a “no-no” time, but this autumn we decided to be naughty and do it anyway. 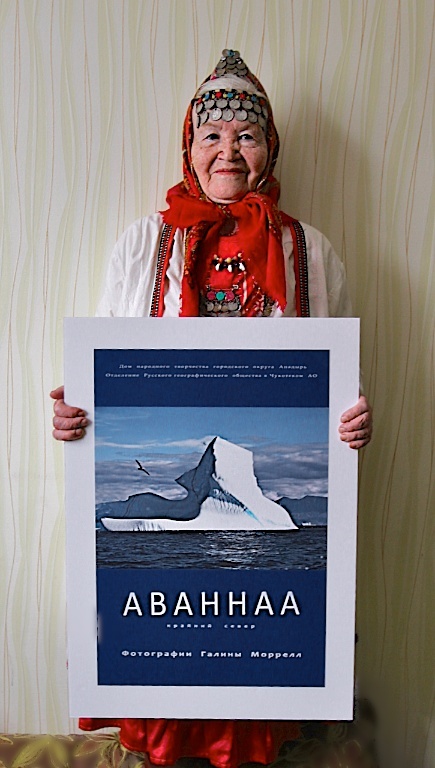 Anna Rintuvie Chukotka. Photo © 2013 Galya Morrell. Chukotka is a place where the morning is born. From America to Russia, from yesterday into today, the Sun rolls over the Bering Strait, and illuminates everything around. A sunrise like this is given to remind us that life is a circle. That our Planet is a circle. And that we too are part of a circle. Bering Sea. A marginal sea. It divides Asia and North America. It may be the first point of entry of humans into the Americas. 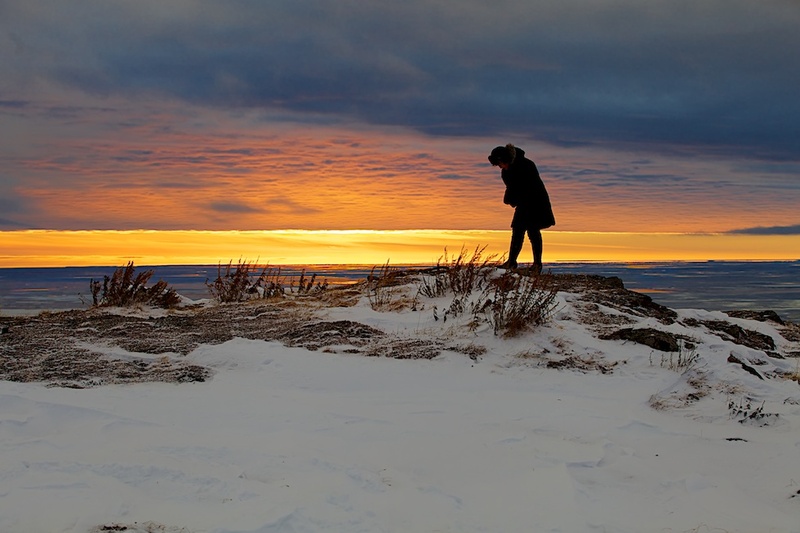 As we stand here with our friends, in total silence, we think of our ancestors who were so curious to see what was there behind the horizon that they were not afraid to travel on the sea ice with their families – in total darkness, on drifting ice – into the unknown. Curiosity is the biggest engine that drives our Life. 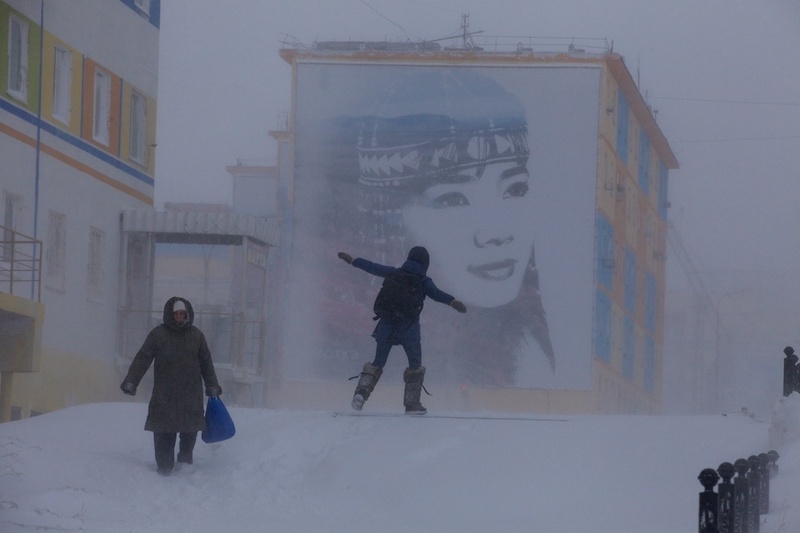 Fierce winds, very high humidity and freezing temperatures make Anadyr’s climate one of the harshest in the entire Chukotka. Sun is scarce, fogs are plentiful and winds seems to never stop blowing. Weather is awful, food prices are the highest in entire Russia, but nevertheless 13,000 people live here today. Most do not have any intentions to leave. Anadyr lies on the shore of Bering Sea 12 time zones away from London, 17 time zones from New York and 23 time zones from Aleutian Islands in Alaska. It is located 6,500 km from Copenhagen, 5,100 km from Nuuk and only 3,600 km away from Thule Air Base. It is the easternmost town in Russia and the closest to the American border. Winds in November are so fierce, that at times you feel like a feather in the air. 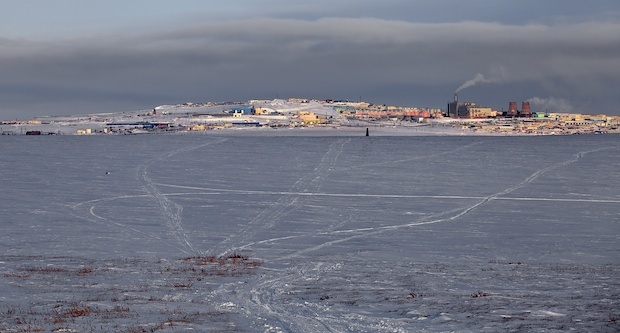 With 92 % humidity and Avannertunnguuvoq – a harsh northern wind of 45 km/hour – it feels really cold. But for the children who live here it is a perfect weather for a hike. We follow them to the top of the Camel Mountain – the best place to greet a New Day on Planet Earth. 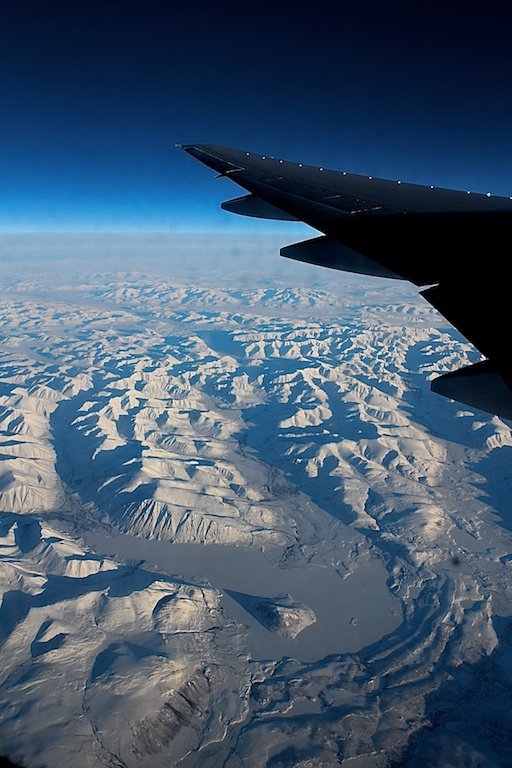 We came to Chukotka with the First ever Greenland Week here. 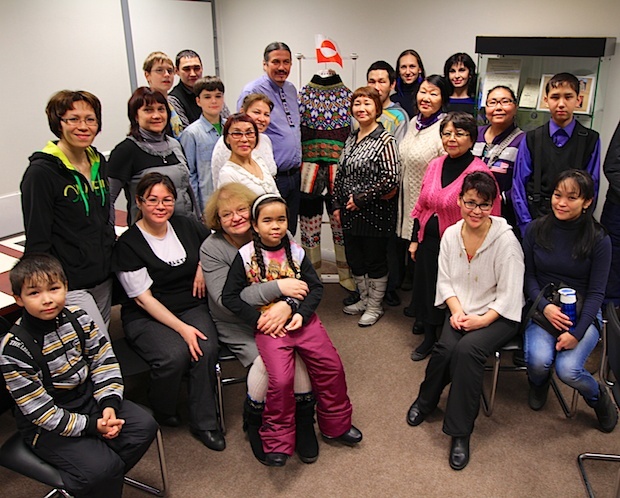 Thanks to Tatiana Archigina, the head of ICC, Vladimir Sertun, the head of the Russian Geographical Society in Chukotka and Olga Rastorgueva, the head of the National Museum, Greenland Week became a part of a month long celebration of the International Inuit Day. 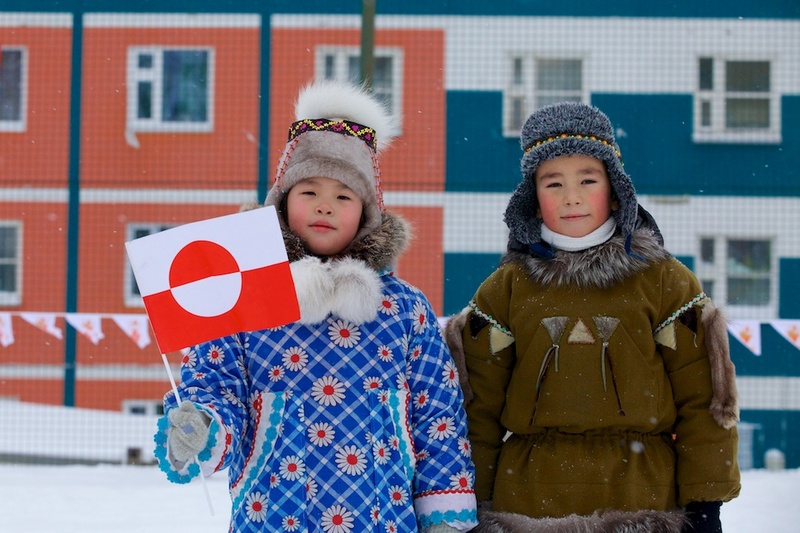 Erfalasoq (the Flag of Greenland) travelled by dogsled, reindeer sled, skidoo, helicopter and by foot; it was carried by the very old and the very young. 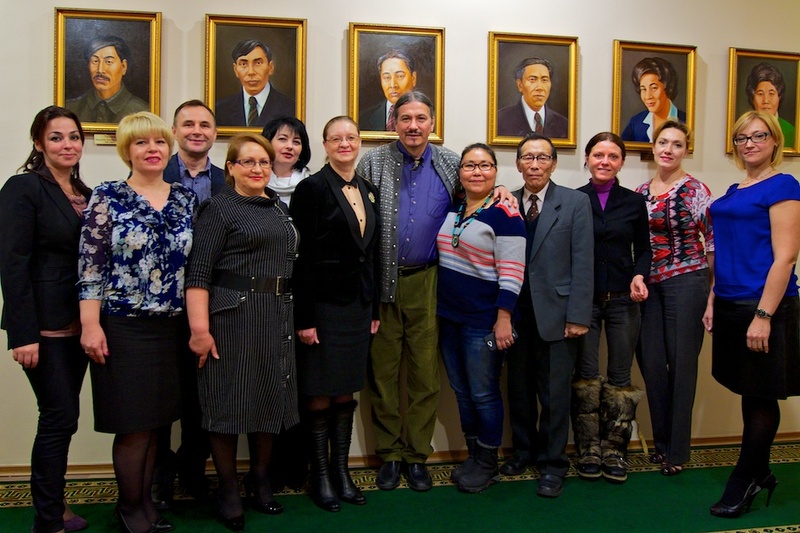 Greenland Day in the Parliament of Chukotka. 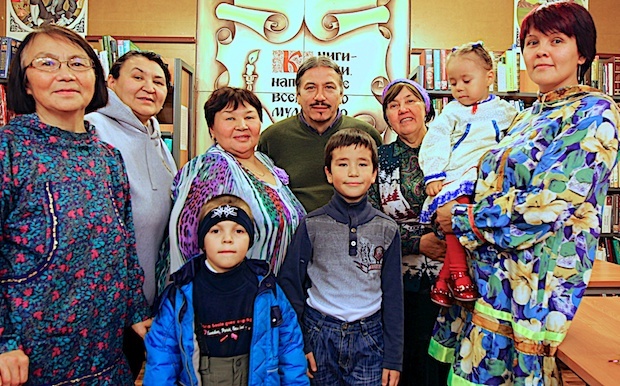 … to the Red Cross and Russian Geographical Society centers. Greenland and Chukotka are far. And yet so close! 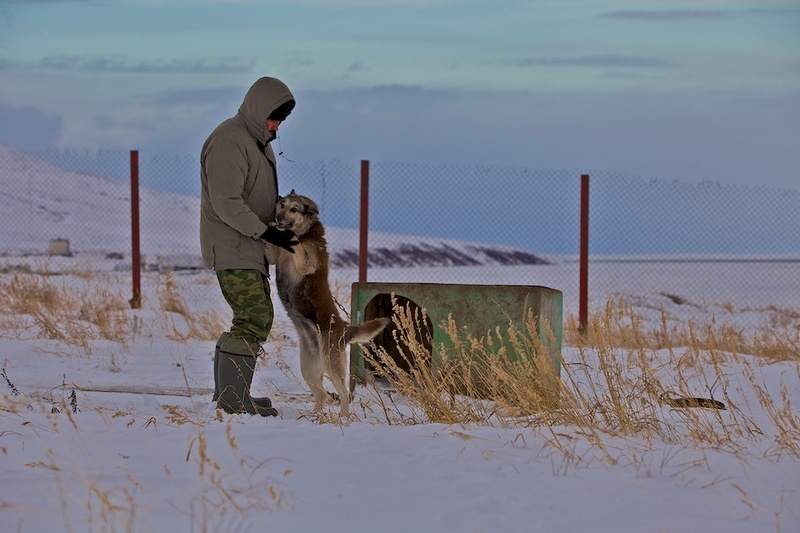 Dog-sledders speak the same language in the High Arctic! It was a good long day! 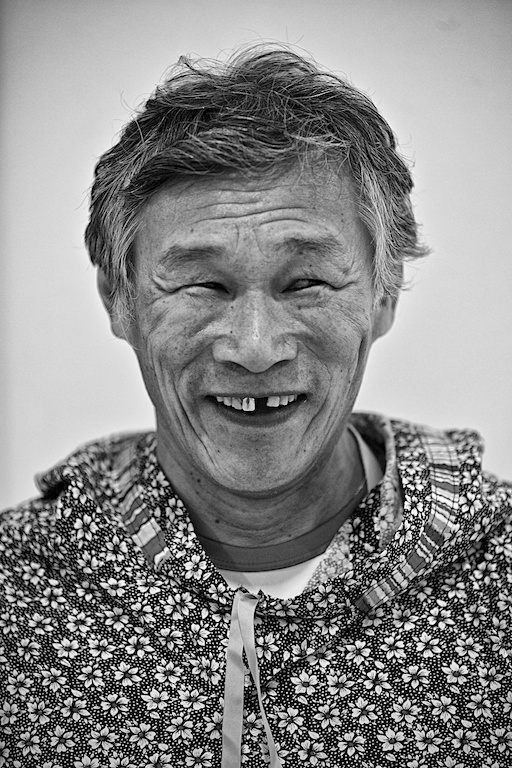 We spent it with one of the best mushers of Chukotka. 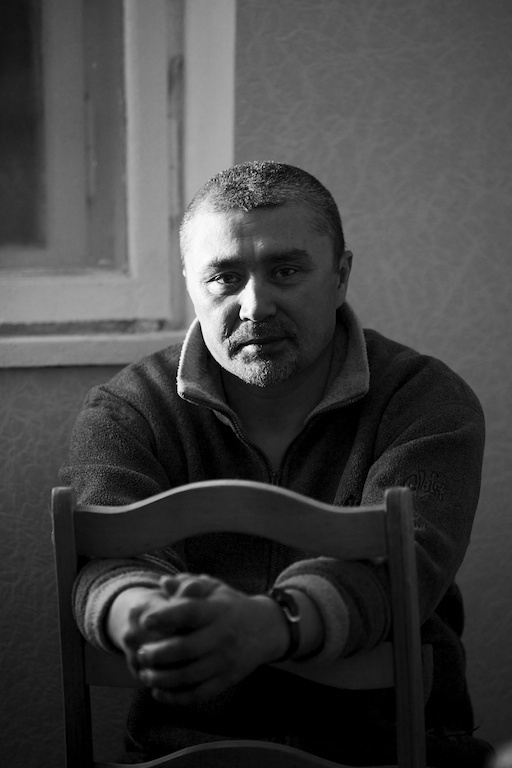 Mikhail Telpin lives in Yanrakkynnot – on the coast of Bering Strait. He hunts walrus, whale, and seal. When he has time, he takes part in big races in Russia’s Arctic and wins. But only when he has time, because the most important thing for him is hunt. He is a young man – well, younger than us, but he remembers all the traditions that were passed to him by his ancestors. Mikhail is telling us about his worries. 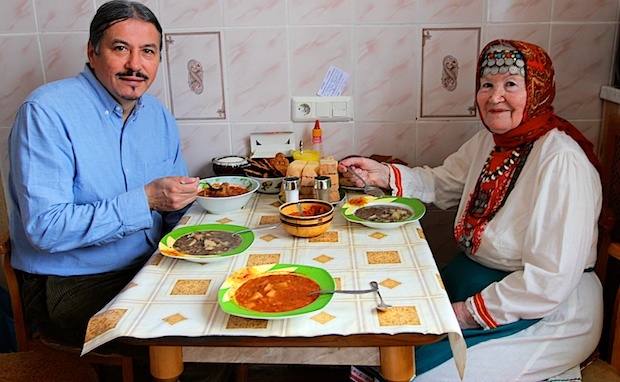 The Cold War and the Soviet Power almost killed native cultural traditions, but now many dream of reviving them along with the language. 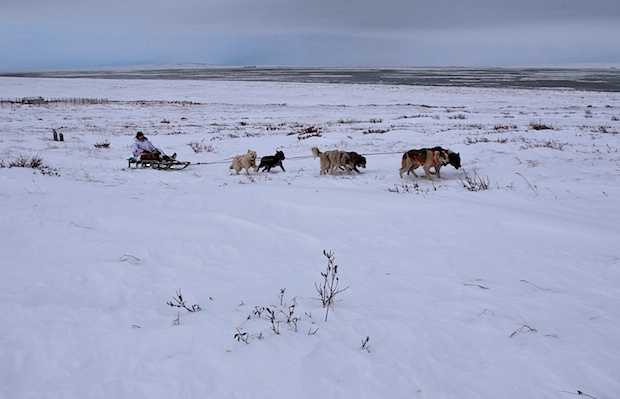 Dog-sledding is a big part of the culture. Mikhail is concerned. He says that the dogs in Chukotka are getting smaller. 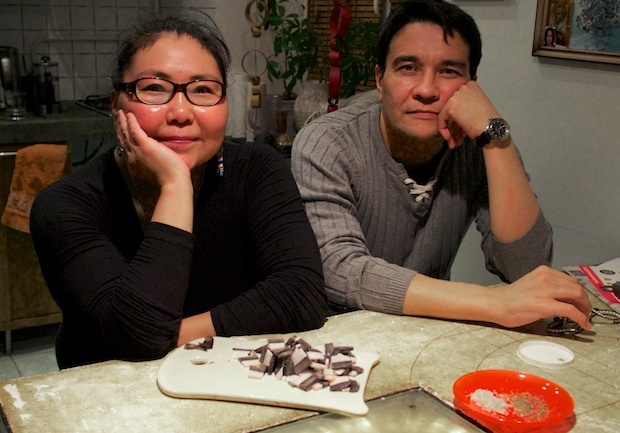 What about cross-breeding them with Greenlandic dogs? He has seen them in action and he admires their strength. “I would like to take a try and see what happens”, he says. Who knows, maybe it could be another cross-cultural project? 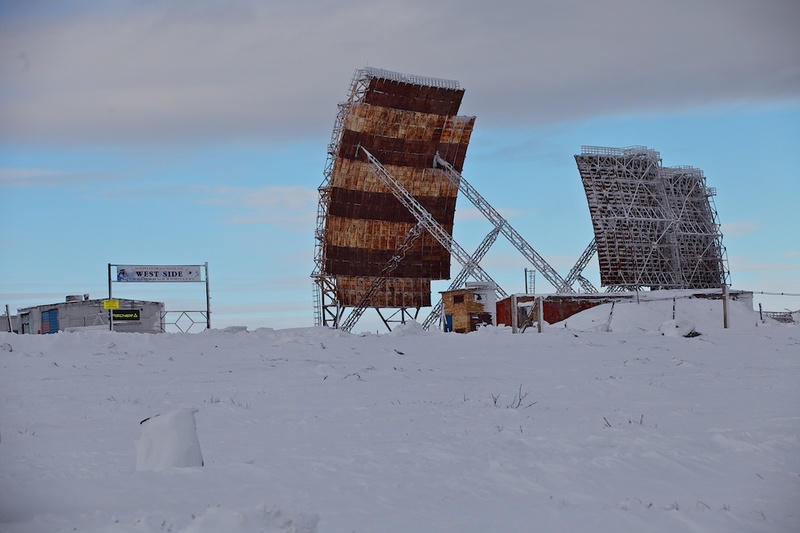 During the cold war, Chukotka was a forbidden zone, heavily equipped with military installations that are now rustling under the harsh Arctic winds. 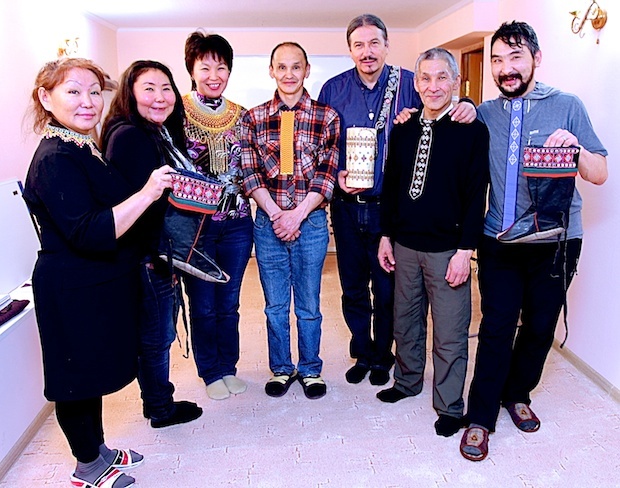 It is still very difficult to get to Chukotka for a foreigner: a special Government issued permit is required in addition to a visa for a visit. And even after the invitation is issued, it takes months to collect all the necessary signatures. But once you are here, the hospitality of the local people does not have any limits. People who live here have gone through extraordinary hardships. Revolution, collectivization, GULAG, Brezhnev times of Zastoi with residential schools and repression of native languages and culture, and finally the first years after the collapse of the USSR when the territory was forgotten by Kremlin, stores were empty and salaries were not being paid for years. Not a single Russian or later Soviet head of state has ever visited Chukotka. Stalin has not been here, neither Gorbachev. Only Dmitry Medvedev, a Prime Minister at that time, came to Anadyr for a short visit. In 2000, in the midst of hunger and total amisery, Roman Abramovich, a Russian tycoon and a future Chelsea Football Club owner, took over the position of Chukotka governor. He sent rescue ships to the North where people were starving, started a construction boom in the capital and repainted it in blossoming summer colors. Once upon a time – till early 60-s – there was only water in Chukotka. And then something happened. Families were torn. Small children left the warmth of their homes into the Cold and froze to death – just to not to see it. 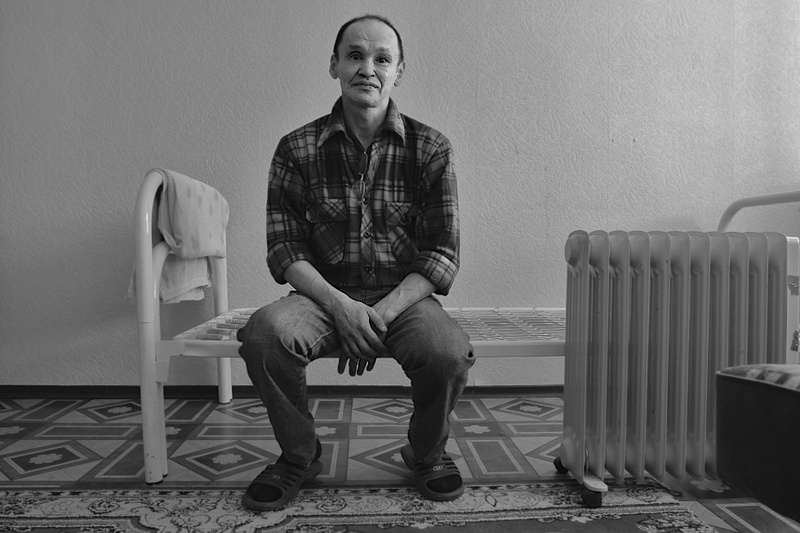 This is Andrey Tnankau. We talked till late at night about alcohol. There was no alcohol in Chukotka till the early 60-s. There were no drunks. And then suddenly something happened. What was it? There are tales. Andrey has his own. Now he does not drink and urges others to stop. This is Nellya and her grandfather Itaukai. Itaukai was born in Chukchi Tundra in 1900. He was a reindeer herder, and a good one. In 1952 he was sentenced to 25 years of GULAG as an “Enemy of the Nation”. Why? There was a neighbor, who was so jealous and angry, that he decided to “report” a “lucky” Itaukai to the authorities. He accused him of unspeakable crimes, and soon after Itaukai was arrested the neighbor got his reindeer. Itaukai is dead, and so is GULAG. People remember the past, but their hearts are open and warm. They are not bitter, they are not angry, they are not looking for revanche. They laugh a lot and they live a Life! 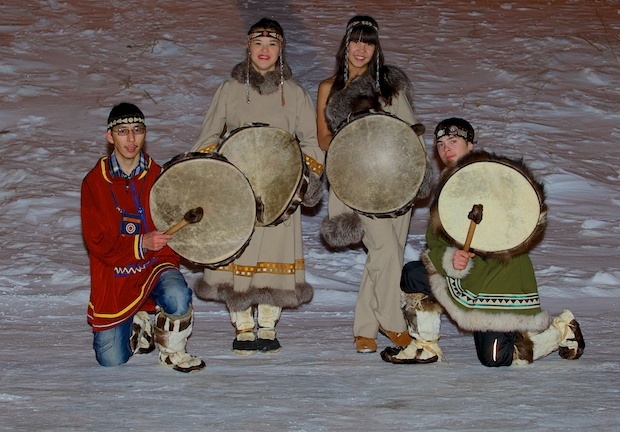 Chukotka is a real melting pot – in the harsh environment of the Arctic. It is a home to over 50 different nationalities. 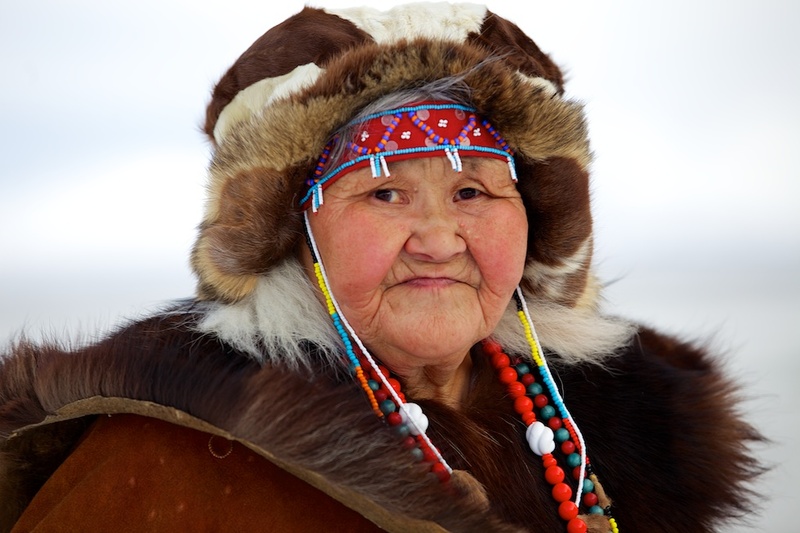 From Chukchi to Yukagirs, from Eskimoes to Evens, from Komi to Chuvans … and now there is even one Greenlander! This night we had a lunch with legendary Anfisa Nikitievna Sharipova, the Mari, the doctor and an artist who lived in Chukotka for over 50 years and who saved many souls in the worst years of GULAG. This is Anna Rintuvie. 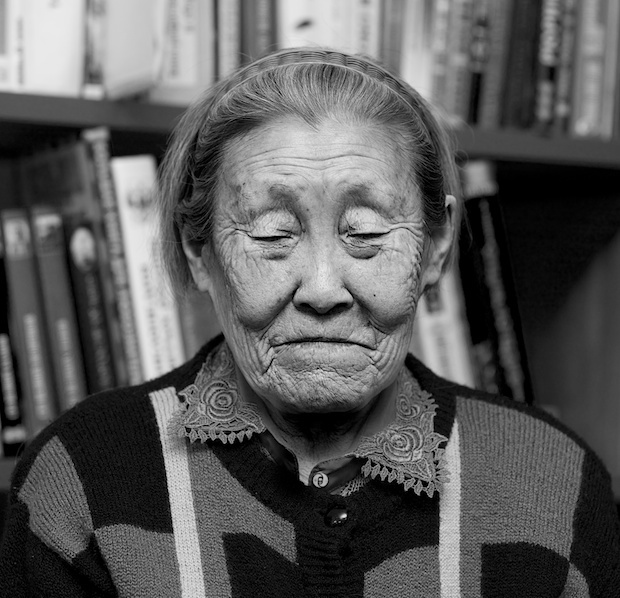 She lives in Hatirka, a settlement of 370, in Chukotka. She gave birth to 10 children – Nadya, Grisha, Vera, Luba, Edik, Ruslan, Andrey, Seriosha, Vasya and Tanya. She knows how to drive dogs and reindeer, how to fish and hunt, and how survive with no absolutely no means in the times of crisis. A poet, a dancer, a singer and an artist, even in the blizzard she performs next the local store in her settlement. 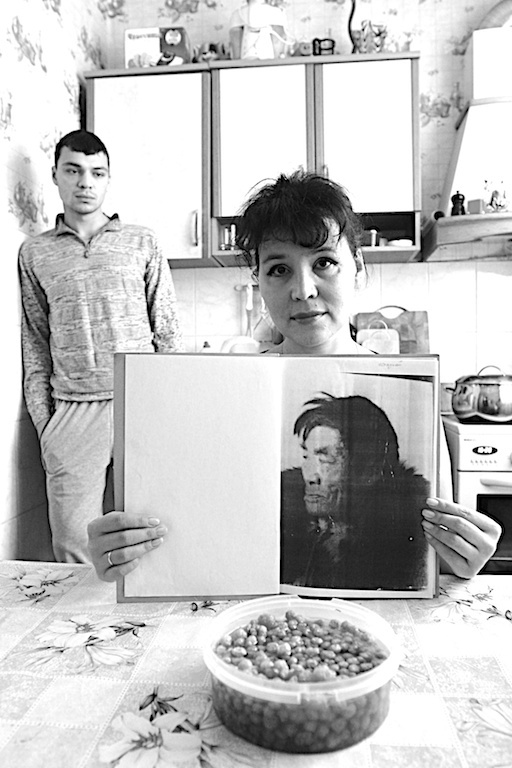 If anyone wants to know how to survive in the times of crisis, with no means, with no money, no food in the store, no electricity – talk to Anna Rintuvie. She can write a book about survival skills but she has no time. She gave birth to 10 children, worked all her life from early morning to late night, and never complained. 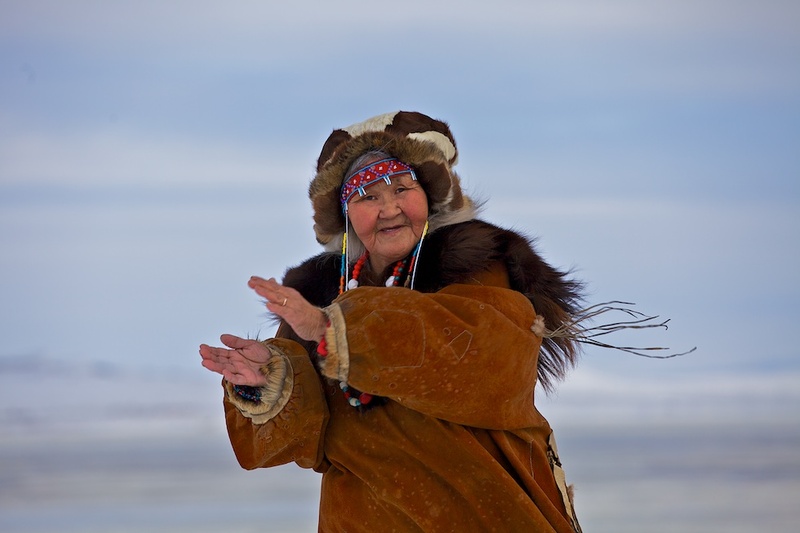 Even in the blizzard she performs next the local store in her settlement Hatirki in Chukotka, a home to 370 people. A poet, a dancer, a singer and an artist, she believes that “life = love”. “Love the nearest ones, give them light, share the little you have” – this is her secret of a happy life. 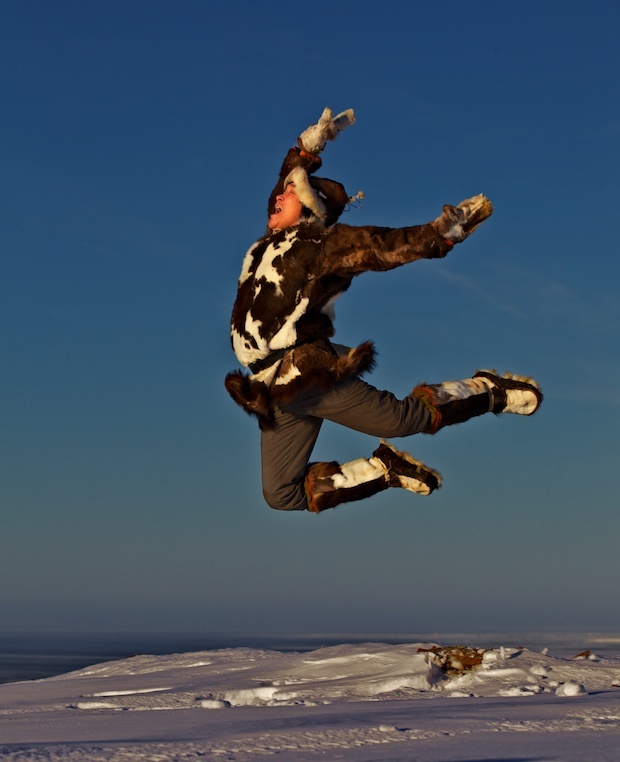 Who said that winter time is a boring time in Chukotka? It is time for мантак (mantak=mattak) and long stories that last over midnight. Harsh wind is blowing from the Anadyrskiy Liman, but it is warm inside and we are happy to be together! 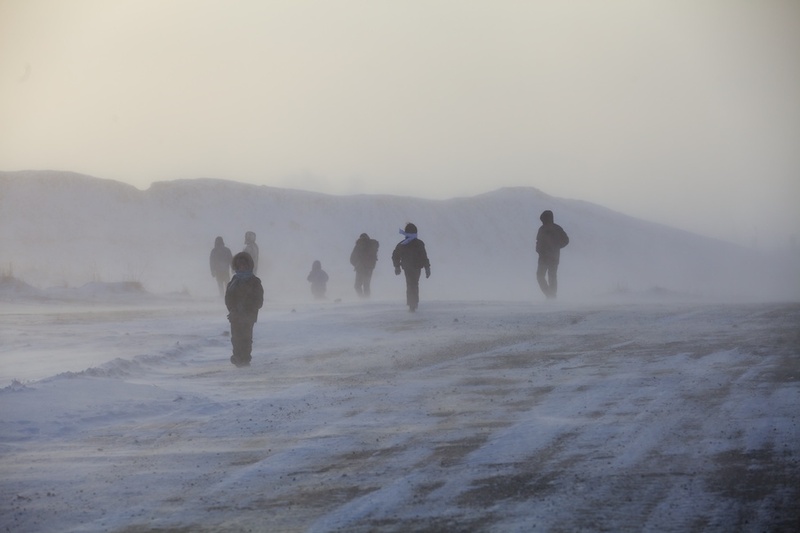 Winds are harsh in Chukotka. They can blow you off into the Tundra, and even further away. But some people can fly with the wind. This is Vlad Rintetegin. He is Chukotka’s Raven. He flies above the sea ice and below it – half-spirit, half-man. Vlad flies high. He can see the weather. He can see the future. We are asking him about ours. He tells us the story. Now we know what to do and where to go. You can ask him too if you want. 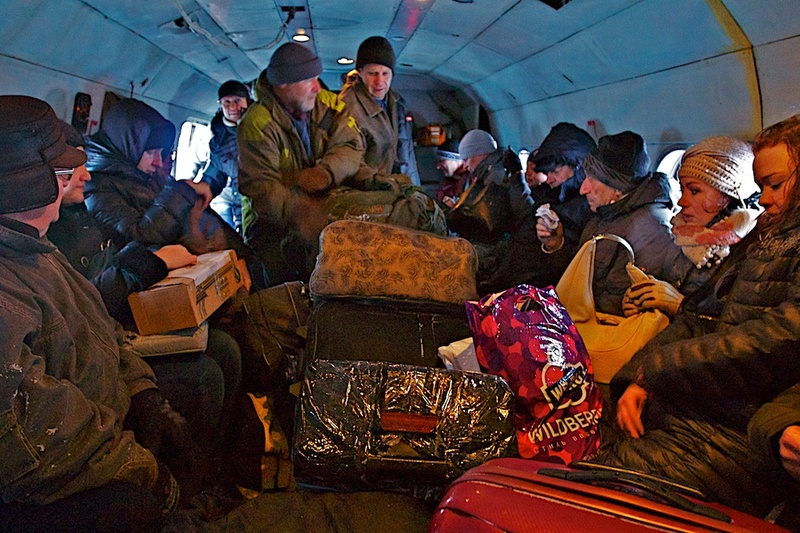 We are leaving Chukotka on one of the shortest days of the year. This time we take the local bus. The Chukotka bus. The bus everyone wants to get on. AeroExpress Mi-8. 17km separate Anadyr from Ugolnie Kopi Airport. 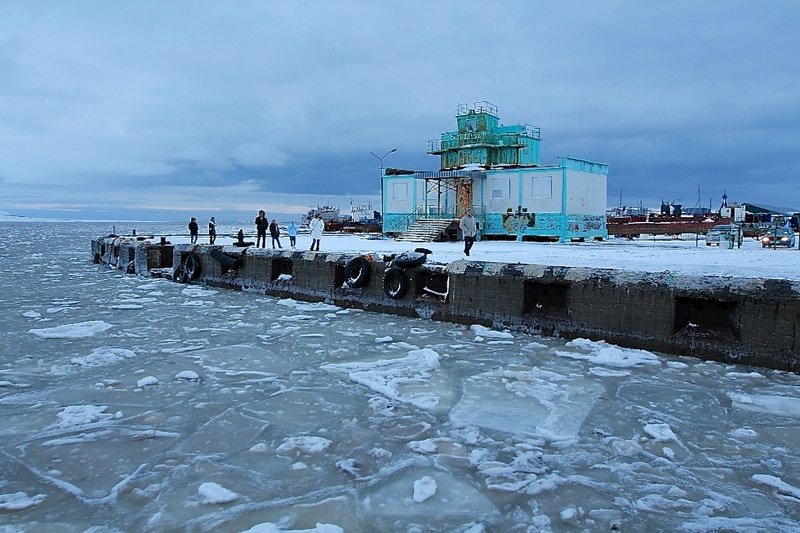 Until Anadyr Bay freezes fully one has to fly – no other option. It can take 10 minutes and it can take 10 days. Time and Space in Chukotka have their own dimensions. And only pilots know how to navigate them. Good bye, Chukotka! We love you! And we will see you soon again!